A strong faith and a yearning to give back inspired Merle and Kathy Felling to open a fund with CommunityGiving, the first fund for the newly established Sauk Centre Area Community Foundation (SCACF). “We’ve been fortunate that we’ve been able to use the money we’ve made to enhance our business and to benefit many families and various charities over the years,” said Merle, founder of Felling Trailers, Inc.
Merle and Kathy bought the business, then known as Sauk Centre Welding from Leonard Gilles in 1974. Within a year Merle started making custom trailers which he sold to local farmers. Over time, Merle and Kathy had four children and for 22 years Merle played in his concertina band one to two nights a week to help grow the business and make ends meet. Daughters Bonnie and Brenda, along with their husbands Paul and Patrick are now the second generation running this family-owned business. The employee count is over 260 -- and growing. A second location was added in Litchfield in 2012. 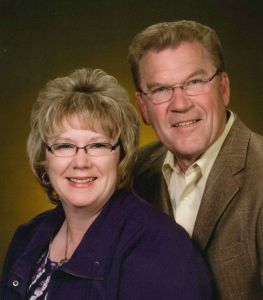 While busy with their business and his band, Merle and Kathy were grounded by their Catholic faith and inspired by two long-time Sauk Centre priests to make philanthropy a part of their lives. They are continuing to direct their giving to faith-based organizations such as their church and Holy Family School in Sauk Centre, and Catholic Charities and Place of Hope in St. Cloud. Local organizations such as CentraCare Health – Sauk Centre and Camp Hill Village, a rural home for people with disabilities are also high on their list. With the establishment of the SCACF, the Fellings felt they had found the right organization to help them fulfill their philanthropic goals. “We hope to help our communities prosper and inspire others to give as they are able for the betterment of our communities as a whole,” Merle noted. Merle and Kathy strive to be good examples for their own children and are instilling philanthropic values in the next generation. The Felling Family Partnership Fund is a tool for their philanthropy.